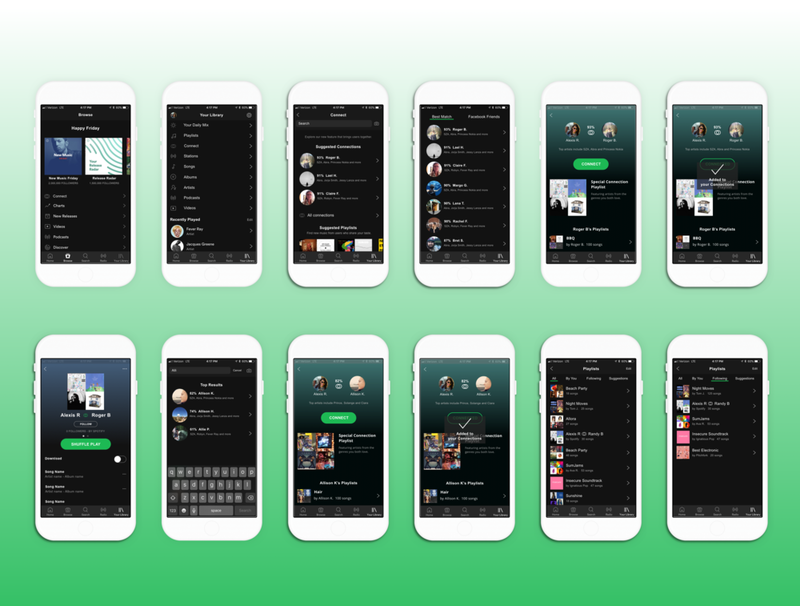 As part of DesignLab's UX Academy I was prompted to design a new feature within the Spotify product. Spotify’s mission is clear: “to help people listen to whatever music they want, whenever they want, wherever they want - in a completely legal and accessible way”. As a streaming music service, Spotify is the group lead, and it wants to stay that way. For this reason, they want to improve engagement and retention in the app. To do that, they want to expand on their social capabilities and build out a feature that will further connect their users to each other. Spotify Connect allows users to match with each other according to their listening patterns. Whether a user wants to quickly discover new music from a friend, or find a common ground playlist with a stranger, the new Connect conveniently partners users together. My goal was to uncover how and why people share music with each other. What goes into their decision making process? How do they currently hear new music? And what are the pain points they encounter while trying to connect with others through music? After drafting up my research plan and an interview guide I approached people at my local coffee shop to discuss their experiences. I compiled my research by organizing the comments from my interviewees into an Empathy Map. From there I could locate patterns that emerged, which expose the goals and need of the user. She is the persona created from my research findings. She considers herself a music lover and has specific friends that she relies on to discover new music because they share a similar taste. She needs a way to efficiently find and organize the music she encounters. After brainstorming ways to address Alexis's needs I started mapping a possible solution. I began with an application map and then moved on to user flows. I wanted to show how the new Connect feature would integrate into the existing product. With Alexis in mind I charted the flow of using the new Connect feature. This helped dictate what screens I would need to design next. Before moving on to the final visual design, I wanted to test my mid-fidelity prototype. I outlined a test plan and performed five in-person usability tests using the InVision app. Each participant was between the ages of 25-33, and had previously used the Spotify app. I asked them to perform the the same four tasks and then received general feedback. Determine if users can navigate through the process. Determine if users feel exhausted/annoyed by the number of screens in the process and locate where/when this happens. Locate areas where user’s are hesitant or confused. I organized the findings from the test into an affinity map, which helped me outline the improvements I needed to make moving forward. Most importantly, I knew I needed to minimize the amount of text within the new feature, and shorten the overall experience of connecting with someone by combining a few of the screens. This project was highly enjoyable to work on and learn through. Spotify is a product I use every day so it was fun to challenge myself to think of a new feature. This project confirmed my assumption that people love to connect with others through music. Whether sharing a new favorite artist with a coworker or going to a concert with friend, music is a great interactive tool.